Thanks to the earlier leak we posted up from evleaks, we knew Samsung had an announcement up their sleeves with regards to a few new tablet unveilings which took place at today’s press conference at CES. We have four new Android-powered tablets in total – the Galaxy NotePro 12.2, and the Galaxy TabPro which comes in three different sizes – an 8.4″, 10.1″, and a 12.2″ configuration. The tablets are quite healthy in the specs department, with the Galaxy NotePro 12.2 featuring cellular radios for HSPA+, as well as 4G LTE. Depending on the market, the NotePro will come equipped with either an Exynos 5 Octa (1.9GHz quad-core + 1.3GHz quad-core) or Snapdragon 800 processor, 12.2-inch WQXGA (2560 X 1600) Super Clear LCD display, 3GB of RAM, Android 4.4, an 8MP back-facing camera, and of course, an S Pen. Naturally, the larger set of tablets (both 12.2″ models) come with enhanced TouchWiz software, including four-way MultiWindow functionality. With that feature, you can have four apps running simultaneously on your screen, which should easily boost your multitasking skills. The rest of the tablets all feature the same specs, except for the different display sizes. And as you might have guessed, the TabPro lineup does not feature S Pens; only the NotePro does. All four tablets will have a global launch in Q1 of 2014. 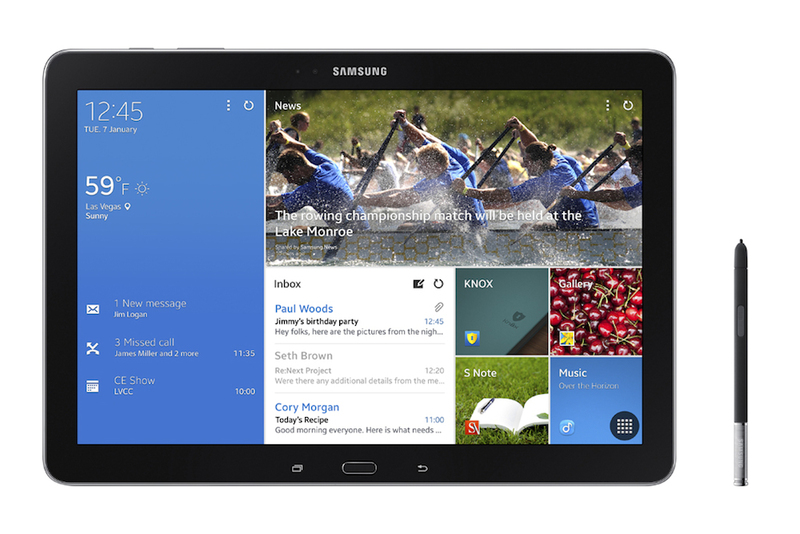 For additional value and productivity right out of the box, the Samsung Galaxy NotePRO and TabPRO (12.2) will feature up to approximately $700 worth of the premium pre-paid, long-term subscription offers from best-selling news, social media and cloud storage providers, including: Bitcasa, Bloomberg Businessweek+, Blurb, Cisco WebEx Meetings, Dropbox, Easilydo Pro for Tablet, Evernote, Hancom Office for Android, LinkedIn,LIVESPORT.TV, NY Times, Oxford Advanced Learner’s A-Z, and Sketchbook Pro (content packages may vary by region).